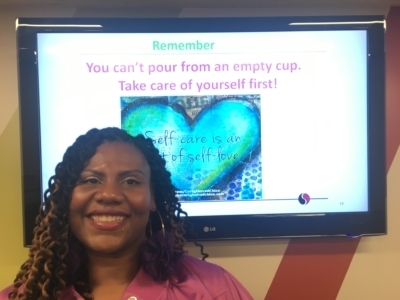 Carla Lee, SHS Patient and Community Education Specialist, offers tips to take control and avoid stress and anxiety during the holiday season. 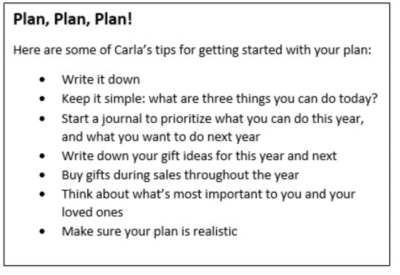 Start with a plan, and focus on what’s important to you, she says. Yes, it’s the holiday season. It’s a time for giving and sharing, laughing and loving, and gatherings with family and friends. Dealing with crowds at malls and stores? Finding the right gifts and being able to afford the right gifts? Traveling, near or far, with so much traffic and bad weather? Going to that Holiday party or event, or meeting with relatives – especially the ones you can’t stand? Managing all this along with the normally hard-to-balance workload and family life? Carla Lee, SHS Patient and Community Education Specialist, has some tips to help anyone who answered “yes” to any of those situations. Here are some of her other tips for dealing with other stressful scenarios. Gift-giving: Establish a budget and stick to it. Use cash, and when you’ve run out, you’re done. Consider: Does everyone need a gift? She notes that when her favorite nephew had a baby, she opted to give a gift only to the baby – not to the adult nephew. She also suggests having a few small spare items on hand – holiday cards with a gift card to a coffee shop, restaurant or movie theater tucked inside – in case you need something quickly. And when money is an issue, time is the best gift of all. Offer to help out with wrapping gifts, cooking, or just visit with a loved one. Gaining weight: Focus on eating healthy throughout the day and drink lots of water. Get up and move around regularly. Maybe even start a series of little exercises you can do anywhere, such as the Neila Ray Office Workout. If you are going shopping, park in the far lot and walk in. You’ll avoid some of the traffic and get some exercise on the way. Travel: Plan ahead! Coordinate with others and pick the kind of travel that works for you. If you don’t like to drive, consider taking a plane, train or bus. If you have to drive, map out your schedule and pick times to avoid maximum traffic. Or, think about using technology to be with a loved one without traveling. Use your smartphone, tablet or computer to have a Facetime or Skype session. You can even watch a movie together! Balance: Remember, it’s OK to say “No.” You don’t have to agree to everything. It’s OK to skip a party or limit your commitments. It’s also OK to ask others for help. You can say “No” without guilt. Missing a loved one on the holiday: For this special kind of grief, Carla suggests allowing yourself to remember while also starting a new tradition. It might be hanging a special ornament on the tree, lighting a candle, or gathering with others to reminisce with you. Breathe. That’s right…just breathe. Deep, intentional breathing can help calm you down when the stress levels rise. A simple step is to use box breathing as a calming tool: inhale, pause, exhale, pause. If stress or anxiety are beyond what you can handle, please call to schedule an appointment with Behavioral Health at 816-923-1070. The National Suicide Prevention Lifeline phone number is 1-800-273-TALK (8255). Support Holiday Book Drive for SHS Kids Mission Possible: The Best Champs Holiday Party Ever!